Hack Circus for Interesting 11… thank you! Seems pointless duplicating everything everyone else has already written about Saturday’s “Interesting” conference, so I’ll keep it brief. Roo has all the best links, as usual – admirable levels of detail and accuracy! First of all, I really enjoyed the whole day. Highlights for me were Chris Heathcote’s food-tasting masterclass and Alby’s mass mousetrap madness. I had a section too, this year, and having invested so much time in this one, I was, like Russell, incredibly moved by the general goodwill of both punters and performers. By way of thanks, here’s a very VERY quick bit of behind-the-scenes and some responses. Hack Circus came about because Russell offered me an hour to do ‘whatever I want’. This is exactly the kind of brief I love, although the result might not have been that surprising to anyone familiar with my usual output! Let me just undermine my gratitude to Russell and everyone involved right now, by saying that this was a massive indulgence for me. It was a treat to be able to spend some time with some of my very favourite people. If anyone else enjoyed it, well, that’s a bonus. We had an incredible performance from the over-booked, unbearably talented Sarah Angliss. I don’t think anyone was prepared for quite how good that was going to be. She even offered some impromptu (and very popular) theremin lessons afterwards. It’s important to stress: Sarah had other stuff on that day. She’d come up from BRIGHTON, for god’s sake. But she left for a bit, she came back, she played, she chatted. She had time for everyone. Mark Hibbett was wonderful, too, embracing the brief and getting everyone on their feet at 11am on a Saturday. The Nine Owls in a Baguette guys were tremendous sports – the band brought an analogue synth the size of an upturned sofa. In a taxi. AND were all set up by the time I arrived at the hall at 9am. 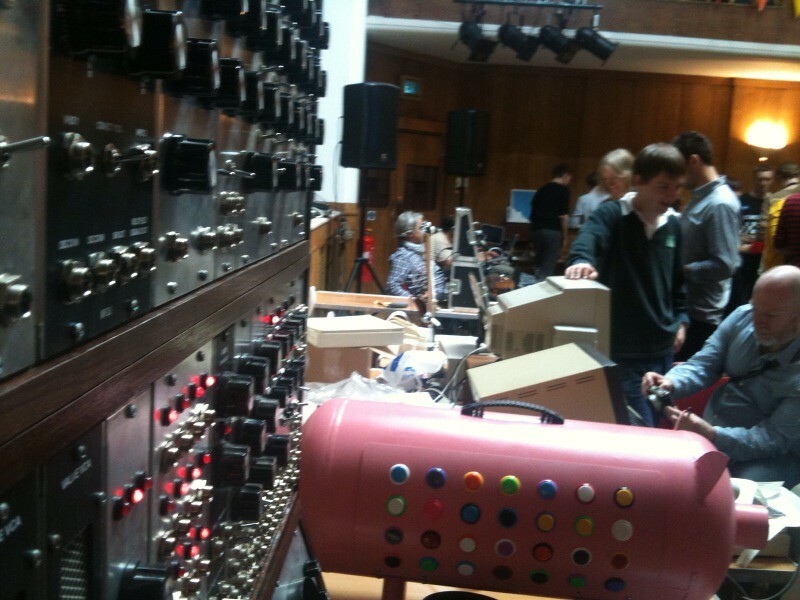 The TNMOC volunteers (volunteers!) had embarked on a week-long military operation just to get me the things I asked, a series of precarious steps further troubled by the fact the principle instigator of the mission, Cray supercomputer expert and teletype restorer Adam, isn’t yet old enough to drive. James Adam had actual meetings with me about what he could hack together out of his receipt printer, and one of my best and oldest friends Sandy made the trip down from Edinburgh with a bulging bag of hardware. All I had to do was ask them. and everyone loved Sandy’s invention, the polargraph. The Flickr and Twitter tags are Interesting11 and Interesting2011, I can recommend a quick search; it was a very photogenic event this time! This entry was posted on	June 21, 2011 at 6:40 pm	and is filed under Uncategorized. Thank you for inviting me, it was an absolute pleasure to be a part of it! I am jealous of everyone. I spent Saturday on the hard shoulder of the M11 with a shattered differential gearbox. Thanks Leila. I always like hearing about what you do. Glad you had fun James. I think you would have enjoyed it Adam. Let me know if you want in on any future things, would be fun to do something a bit theatrical sometime, with your help. Maybe using the Domesday disks….